General Motors workers John Ross and Chuck DeKubber work on small-block engine, No. 100 million. The engine, a supercharged LS9 V8 used in the Chevrolet Corvette ZR1, will become part of GM's historical collection. 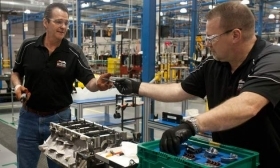 General Motors built its 100-millionth small-block V-8 engine on Tuesday, marking a milestone for the company. Engine No. 100 million is headed for GM's historic collection. Chevrolet introduced the small-block engine in 1955. Since then, it has been used all over the world to power everything from cars and trucks to boats and industrial machines. Currently Chevrolet, Cadillac and GMC use it in the United States while Vauxhall and Holden use it overseas. The small-block program began in the years after World War II, when chief engineer Ed Cole transferred from Cadillac to Chevrolet. Cole retained the design of the company's Stovebolt engine while decreasing weight and adding power. It was a better way to build engines, according to Chevrolet, that took advantage of streamlined production techniques. "The small-block is the engine that brought high-performance to the people," said David Cole, founder and emeritus chairman of Center for Automotive Research, and Ed Cole's son. "There is an elegant simplicity in its design that made it instantly great when new and enables it to thrive almost six decades later." Chevrolet installed mechanical fuel injection in 1957 but discontinued the feature in the mid-'60s. In the 1980s, electronically fuel-injected engines debuted, including the famous 1985 Tuned Port Injection unit. The pinnacle of the current generation of small-block engines resides in the Corvette ZR1's engine bay. It produces 638 horsepower and 604 pounds feet of torque. The first engine delivered 195 hp.